승용차, 그것도 아직 새 차로 자동차 무덤이 생겨나 이목을 끌고 있다. 차들 중 35만 대를 70억 불을 들여 사들여 보관하고 있는 일부라고 한다. 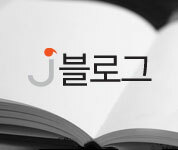 이들 차량들은 앞으로 규제가 풀리면 재 판매 또는 수출 길이 열리게 될지도 모르는 형편이라고 한다. 어쨌던 자원의 낭비가 이닐 수 없을 듯 싶다. 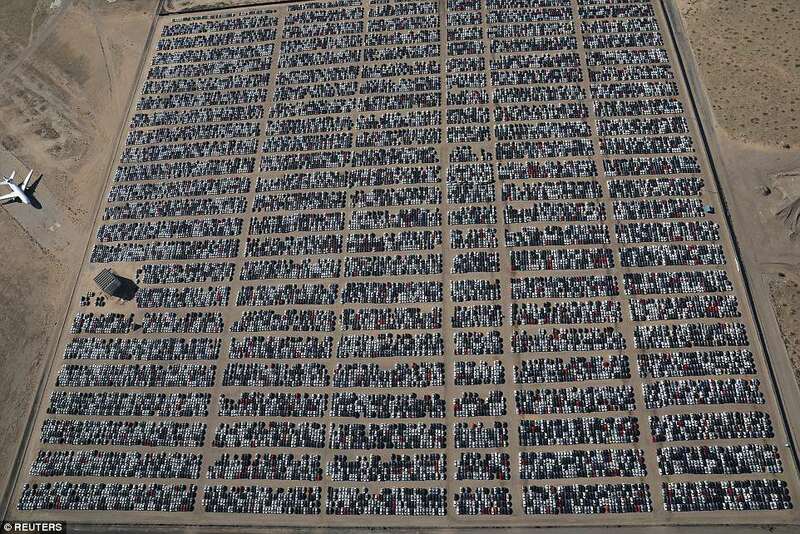 Shocking images have emerged showing lines of cars stretching out as far as the eye can see in the Californian desert after Volkswagen was forced to buy back 350,000 cars for $7.4billion over the diesel scandal. 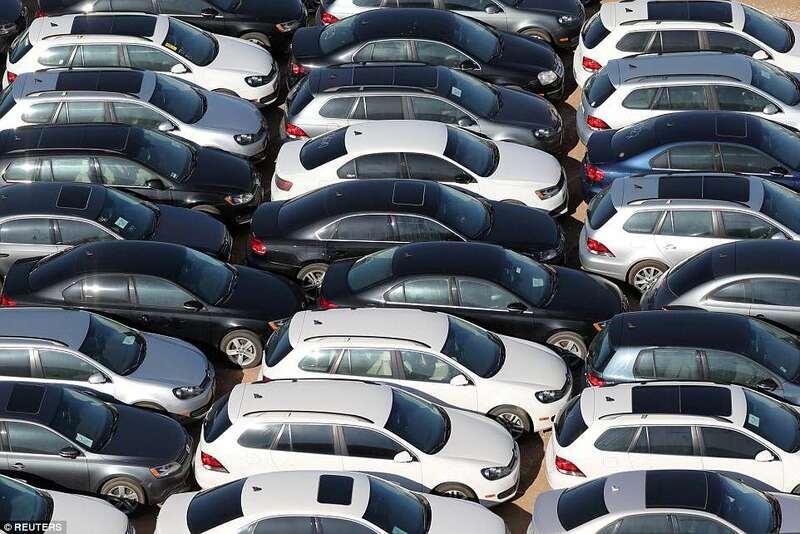 The German automaker has been forced to get creative when it comes to responsibly storing the hundreds of thousands of vehicles they had to buy back. 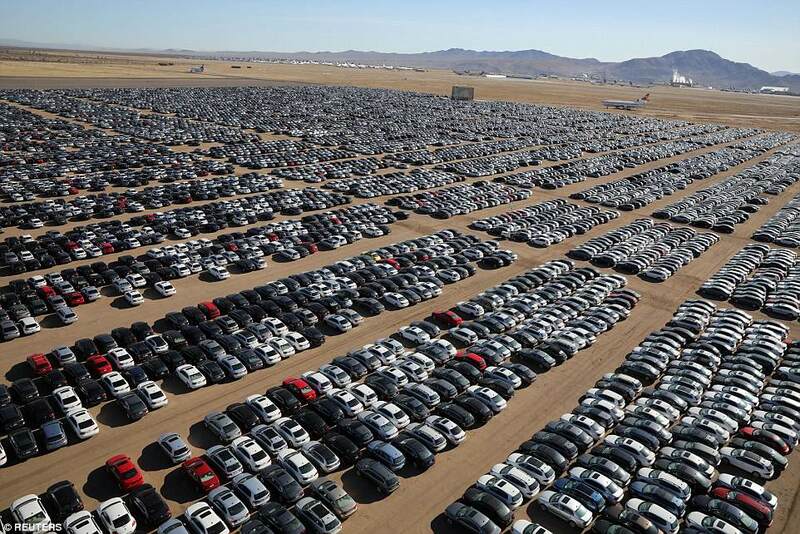 VW spokeswoman Jeannine Ginivan said in a statement on Wednesday that the storage facility in Victorville, California, is one of many 'to ensure the responsible storage of vehicles that are bought back under the terms of the Volkswagen' diesel settlements. 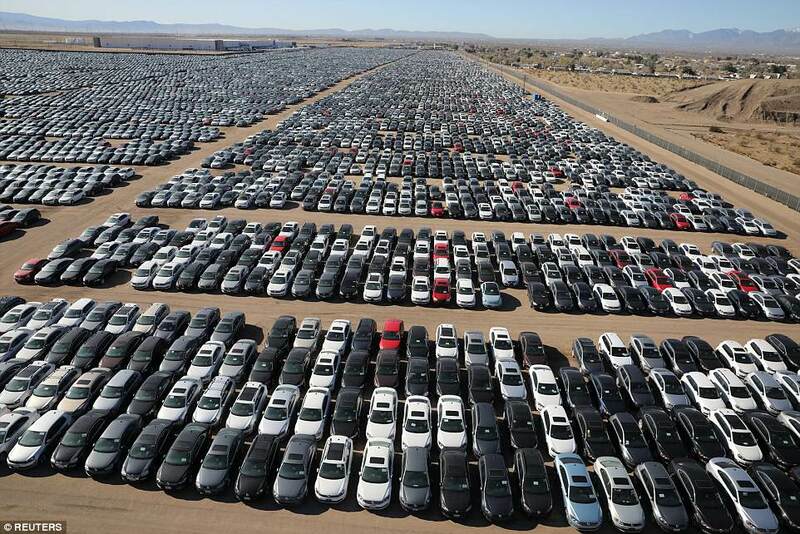 'These vehicles are being stored on an interim basis and routinely maintained in a manner to ensure their long-term operability and quality, so that they may be returned to commerce or exported once U.S. regulators approve appropriate emissions modifications,' she said. 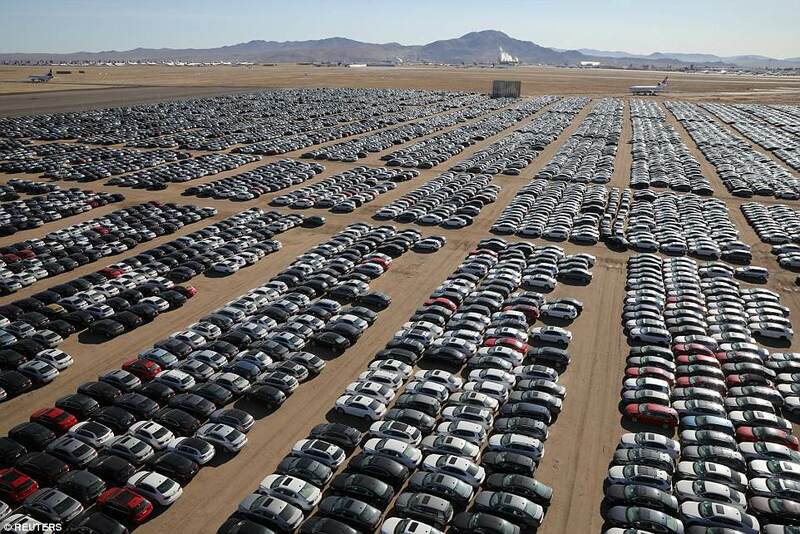 While it was originally suggested Volkswagen may scrap the hundreds of thousands of cars for parts, it now appears that the manufacturer is hoping to return them to the market once they meet emissions guidelines. 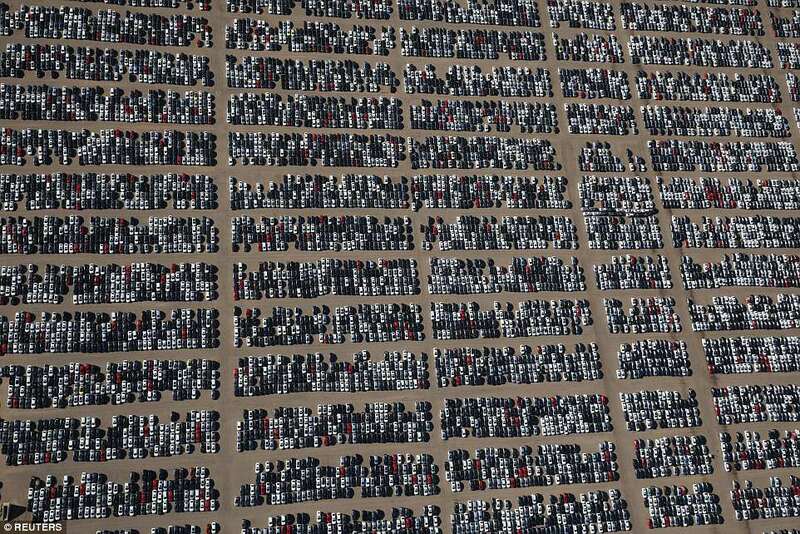 But it may be some time before stung customers rush out to buy another VW. In April 2017, Volkswagen was sentenced to three years probation after pleading guilty to three felony counts and paid $4.3 billion in federal penalties. 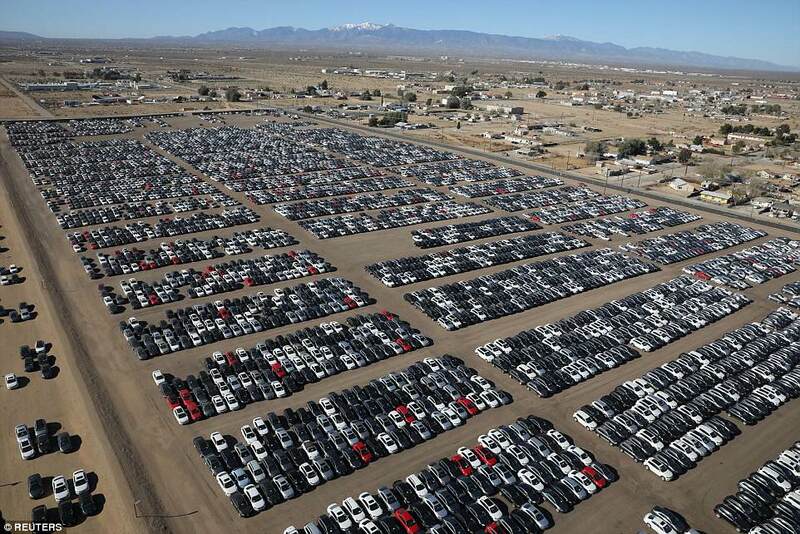 Owners of affected vehicles in the US are being offered compensation worth thousands of pounds each, but the manufacturer is refusing to make payouts in the UK. In January, the FBI arrested top VW executive Oliver Schmidt in Florida on conspiracy charges relating to the fuel emissions scandal. He led the German company’s US regulatory compliance office from 2014 to March 2015. Lawsuits accuse Mr Schmidt of playing ‘an important role’ in Volkswagen’s efforts to conceal its emissions cheating from US regulators. Watchdogs, MPs and consumer groups have expressed outrage at Volkswagen, saying the firm must pay out for cheating on emissions tests to make millions of their diesel vehicles appear less polluting. The German automaker pleaded guilty in March 2017 to criminal charges that it defrauded the US and conspired to violate the Clean Air Act. 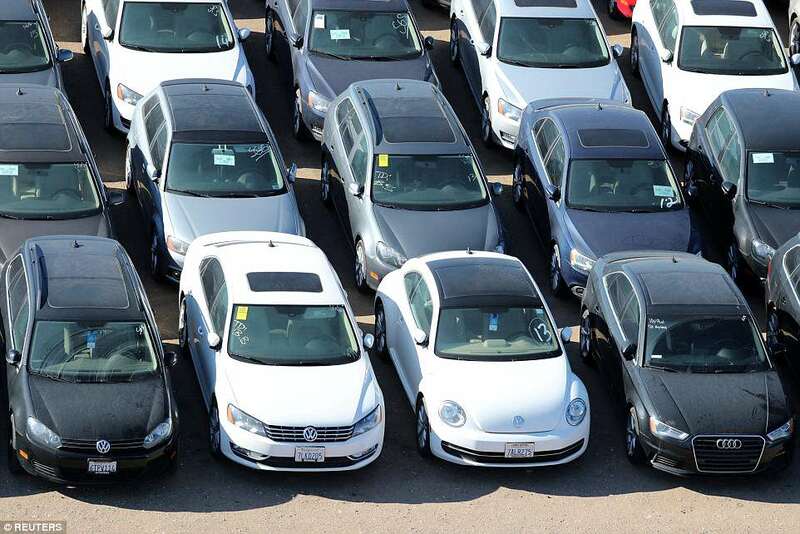 The company agreed to pay $4.3 billion in criminal and civil fines, on top of $17.5 billion the company had already agreed to pay in settlements with car owners, dealers and for environmental cleanup. Regulators in 2015 discovered that Volkswagen diesel cars marketed as clean in fact spewed up to 40 times the permissible limits of nitrogen oxide during normal driving, but this was hidden during emissions testing. The company developed the illegal technology in 2009 and prosecutors alleged senior employees attempted a coverup after learning of the scheme in 2015. Volkswagen still faces an array of legal challenges in Germany and worldwide relating to the scandal. The global carmaker has so far set aside more than $24.4 billion to cover fines and compensation related to dieselgate, but experts estimate the final bill could be much higher.